The Fellowship was fortunate enough to obtain a copy of WITCHBLADE #1 from Image Comics. Caitlin Kittredge writes, Roberta Ingranata draws, Bryan Valenza colors, and Troy Peteri letters. Alex used to be a journalist, embedded in Afghanistan. She’s back now, and has a new job helping victims for the DA’s office. She’s also been having odd dreams about returning from the dead, and today she woke up with no memory of the last 24 hours. Is she going crazy? Or is she becoming something else? And is it related to the weird bracelet she found on her wrist? 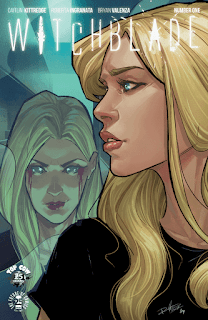 The Witchblade has a new host, or it will if she survives her run-in with a wife beater. And this series is back after a two-year break with an amazing new creative team. This story puts Alex in a great position to help people who need it, and the art is just phenomenal, adding fantastic dream sequences and a sense of uncertainty to mirror what Alex is feeling through all of this. This is a very strong first issue for the return of a series with a lot to live up to. I’m excited about this book, and you will definitely want to check it out. WITCHBLADE #1 is available now from your local comic shop, or online at imagecomics.com.